Ford is wanting to cut 370 workers at an engine plant in south Wales in a first phase of up to 1,000 job losses, BBC Wales understands. Unions have pledged to fight compulsory redundancies at the car giant’s plant in Bridgend after they were briefed by Ford management on Friday. It is believed the first tranche of cuts would be offered as voluntary redundancies. Ford is looking to shake up its European operations. It is nearly two years since fears of 1,160 job losses at the plant by 2021, emerged in a worse case scenario. The factory, which employs around 1,700 workers, won the investment for Ford’s latest petrol engine – the Dragon – but that will only employ around 500. If plans go ahead, the Bridgend jobs – almost half of the site’s workforce – will go in two phases by 2021, as part of 1,150 losses across the UK. Ford declined to confirm the figures and said it was currently consulting with unions. It said these talks were ahead of it implementing a “comprehensive transformation strategy”. 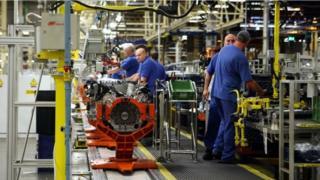 Jeff Beck, GMB organiser, said the union would “fight for every Ford job in Bridgend and across the UK. The Unite union called it “grim news” and said shop stewards had been given a briefing. “It is a devastating blow for our members and their families, as well as having grave implications for the Welsh economy and the supply chain,” said officer Des Quinn. He said representatives would consult with members over the coming days. “There are a number of factors behind this grim news – the main ones being challenging market conditions for carmakers generally, a lack of a coherent industrial strategy from the UK government and the uncertainty created by Brexit. “Over the last two decades the UK car industry has experienced a renaissance of which we can all be proud of. Media captionThe story behind how the Ford engine plant in Bridgend was built between 1977 and 1980. We have already heard this week about Ford’s review of its European operations – as well as the cutbacks at Jaguar Land Rover. But this news today is something that unions have feared for nearly two years. This is because it was widely known, that Bridgend’s contract to make engines for JLR was coming to an end and that Ford’s own plans for a new engine had been scaled right back. Ford have said discussions have only just started and details of numbers are “premature”. But we understand that early talks are around a first tranche of job losses involving voluntary redundancies. The 1,000 losses would come alongside 150 in Ford’s transport operations, which would affect lorry drivers. On Thursday, the company said it would be speeding up plans to cut structural costs and thousands of jobs would go across Europe. “We are taking decisive action to transform the Ford business in Europe,” said group vice president for Europe, Steven Armstrong. The announcement from Ford came on the same day as Jaguar Land Rover said it was axing 4,500 jobs and Honda said it was halting production for six days after Brexit.